Removes and installs tapered roller bearing at base of steering stem. 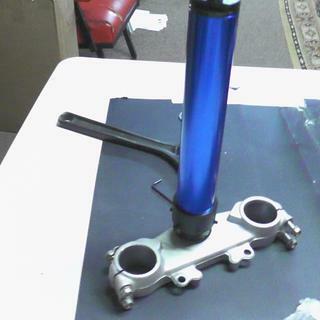 Fits most motorcycles with tapered roller bearing at base of steering stem. Includes 26 mm, 28 mm, 30-31 mm, 35-36 mm race protectors for installing bearing race. Blue anodized bearing protectors are made from 6061 billet aluminum and laser etched for easy identification. Compact design to fit within steering stops on lower triple clamp. 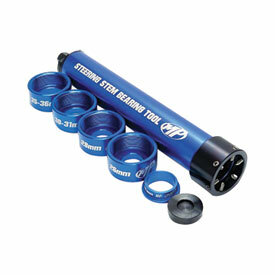 Protects steering stem during bearing removal and installation process. This tool is the best. I did the stem bearing on my DRZ and it was super easy and quick . Will do my Klr650 next. Saved a bunch of money on labor. Brought the tool because the price was good but was a bit doubtful the grub screws would take the load.No need to worry the tool worked perfectly on a XR650R with no damage to the screws,well worth the money. Does this tool also install the races? BEST ANSWER: No this tool only drives the steering stem bearing. You need to purchase a separate tool to install the bearing races. No it does not. You would need the Motion Pro steering stem race driver to install them. Yes it does. This tool is pretty sweet!